Botrytis Cinerea is the dreaded gray mold that can eat up your beautiful buds within a couple of days. Interesting to note this “mold” is caused by a fungus, and a tough one at that. It can survive temperatures from 28° to 90°F. Gray mold goes dormant to defy eradication efforts and harsh conditions. It travels on wind, interior air movement, tools, clothing and plant parts, and it survives attempts to remove it via mechanical methods, such as trimming out affected parts of your marijuana plants. Botrytis Cinerea loves temperatures in the range of 68° to 77°F, which is bad for you as a marijuana grower, because that’s also a useful temperature range for your cannabis plants. Gray mold can tolerate temperatures below 70°F better than it tolerates temperatures warmer than 70°F. Gray mold loves high humidity, and this gives you the opportunity to use venting, dehumidifiers or air conditioners to keep your marijuana grow room humidity between 46-53%. It’s harder for gray mold to get established in a marijuana grow room with low humidity. Just know that low grow room humidity can stress your plants because they transpire more and take in more nutrients water. In some cases, this could increase gray mold problems, as more moisture transpires from leaves and buds, creating damp conditions that gray mold enjoys. Another great way to block gray mold is to prevent it from getting inside your grow room. The most effective way to do that is build a sealed grow room or retrofit your existing hydroponics set-up so that it’s a sealed system. Building a sealed room takes quite a bit of work and financial investment, but it pays off because molds, fungi, pests and other attackers can’t easily get at your plants. You also get the payoff of controlled climate and increased C02 levels- both of these contribute to faster growing hydroponics plants that yield more. A sealed room is more secure, and less likely to have avenues for gray mold and other pathogens to get in or for odors to leak out. Can marijuana clones vector gray mold into your hydroponics room? It’s unlikely you’ll be bringing gray mold into your room via clones that you purchased commercially, but carefully inspect all clones before you allow them into your hydroponics room anyway, because clones are a vector for pests and diseases. 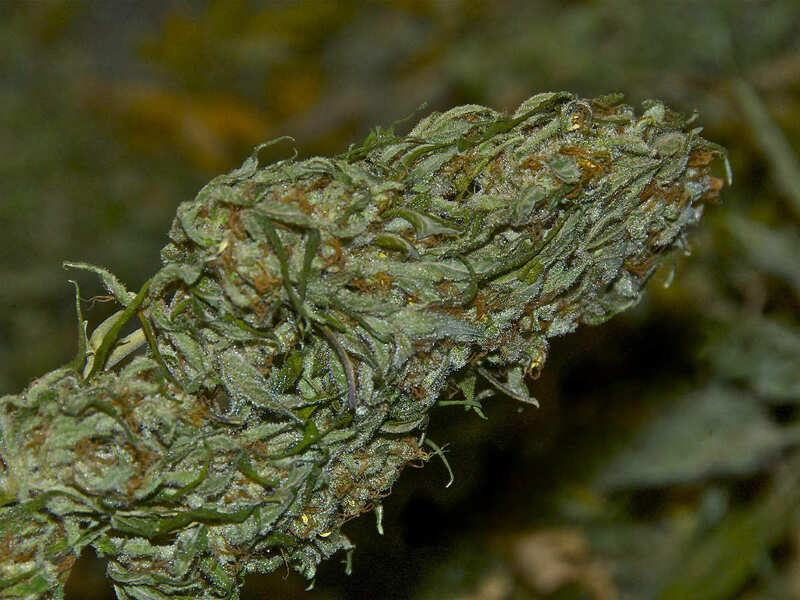 The reason clones are not often a vector for gray mold is Botrytis Cinerea shows up inside phat buds, and cannabis clones you just purchased are not likely to have phat buds on them yet. Read this article for tips on preventing imported clones from harming your marijuana garden. If you were growing outdoors and had blooming cannabis plants that needed to come indoors because of too much rain or cold, those plants might vector gray mold into your hydroponics room. 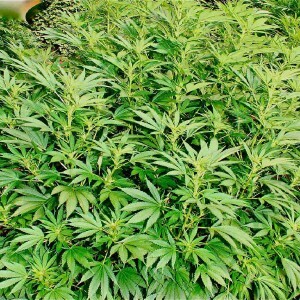 Gray mold loves over-watered and over-fertilized blooming marijuana plants. The excess moisture and nutrients that transpire out of your plants form a great environment for gray mold, especially inside dense buds close to the main stems. I recently saw someone recommending “foliar spraying” as a fix for gray mold. In grow phase, spraying with a safe horticultural soap makes sense and can stop botrytis. But you shouldn’t foliar spray your crops after the second to third week of bloom phase. Obviously, foliar spray just adds to the moisture in your buds, which gives gray mold more of what it wants! Sometimes, no matter how hard you try to keep mold spores out of your hydroponics grow room, they will get in and start to work destroying your crops. It’s most likely to happen during bloom phase, after your cannabis flowers are large and dense. Carefully examine your flowers (especially the densest ones) to look for signs of mold. It’s hard to detect because it starts at the inner stem and eats its way out. The main signs you’re looking for are individual, isolated flower leaves or hairs that rapidly turn brown, curl up and dry out, or a portion of a flower that turns black or grey, or becomes gooey or webby overnight. It’s ugly, and it’s scary- because gray mold undetected can rot a grow room full of flowers overnight. When you find a telltale ruined leaf or other signs of gray mold, turn all the grow room fans off. Cut the entire affected branch off your plant. Then swab the cut, and your cutting tool, with isopropyl alcohol. In many cases, it’s not good enough to just cut off and remove buds infected with botrytis. The absolutely safest thing you can do when you detect gray mold is remove the infected plant and dispose of it. 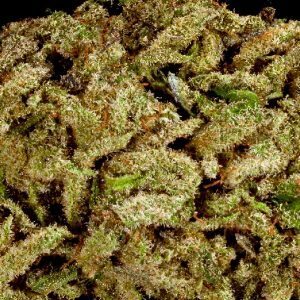 You can salvage tainted buds by throwing them in a clear, consumable alcohol such as gin or vodka, which will extract THC from the buds and eliminate the mold too. If you’re not going to put gray mold buds into alcohol, dispose of them as safely and as quickly as possible. Never allow plants that have been infected with gray mold to come into contact with plants that have not yet been infected. Any time you work with a plant that has gray mold, sterilize all your equipment that touches that plant. Change your clothes and shower after coming in contact with gray mold, before you go back into your grow room. Some people advocate using fungicides or other industrial agriculture materials to fight gray mold. But you’ll be smoking what you’re spraying, and it will hurt you. As a preventive very early in bloom cycle you can foliar spray your plants with Piranha liquid beneficial fungi, but don’t be tempted to use fungicides and other toxic materials on your marijuana flowers. Another preventive tactic is to research marijuana strains to find out which ones are prone to gray mold, and which are resistant. Many hydroponics cannabis growers have a generic and somewhat accurate understanding of this: dense, phat Indica buds are prone to gray mold, but long, thin Sativa buds aren’t. If you live in a high humidity area, haven’t got a sealed grow room, and you see high humidity (above 55%) in your hydroponics grow room and are growing Indicas that are known to be gray mold magnets, you’ve got some serious thinking to do as you proceed in your marijuana growing. You might be best off to change the strains you grow, invest in humidity control and other sealed room equipment, and pay closer attention to your buds from mid-bloom phase onwards. And please note that botrytis can happen in harvested buds if you store them too wet before they’re properly dried and cured. I hope you never experience the heartbreak of gray mold. It can rob you of your marijuana in a particularly cruel and immediate way!